To study the clinico-etiological profile of epilepsy in children aged 1–24 mo attending a tertiary-care public hospital. All infants aged 1–24 mo with epilepsy (as per International League Against Epilepsy, 2014) presenting between April 2016 and March 2017 were enrolled. Detailed history and examination were done in all children, and developmental assessment was done using Developmental Assessment Scale for Indian Infants (DASII). Electroencephalography and neuroimaging (CT/MRI) were done for all subjects. Sixty children (39 males) were consecutively enrolled after informed written consent. The mean (SD) age at seizure onset was 4.3 (4.14) mo. Perinatal asphyxia (45%) and malformations of cortical development (18.3%) were the commonest etiologies. Neurological examination was abnormal in 68.3%, and a neuroimaging abnormality was present in 76% of children. Fifteen patients (25%) had West syndrome, which was symptomatic in the majority (73.3%). Developmental delay (DQ < 70) was the commonest co-morbidity (81.7%); 28.3% had profound delay. Odds of having developmental delay were 13-times higher in those with an abnormal neurological examination [OR 13.5 (2.82–64.67), P = 0.001], and nearly 9-times higher with abnormal neuroimaging [OR 8.9 (2.11–37.9), P = 0.003]. Epilepsy in children <2 y is symptomatic in the majority, with sequelae of birth asphyxia as the commonest etiology. High prevalence of co-morbid developmental delay underscores the need for routine evaluation and early intervention in all high-risk infants. The authors are thankful to Dr. Sapna Singh, Professor, Department of Radiodiagnosis, for her help in reporting on the study investigations. PKS, DM, MJ, KT: Study planning; PKS, DM: Subject assessment and evaluation; DM, KT: Statistical analysis; PKS, KT, DM: Manuscript writing. All authors made important intellectual contribution to study planning, data analysis, and manuscript writing. All authors approved the final manuscript. DM would be the guarantor. 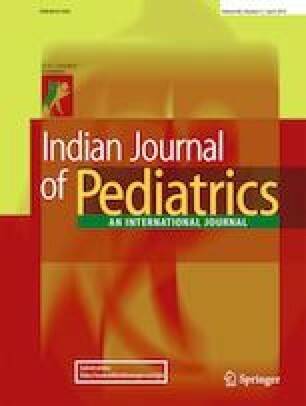 Kharod P, Mishra D, Juneja M. Drug-resistant epilepsy in Indian children at a tertiary-care public hospital. Childs Nerv Syst. 2019 Feb 13. https://doi.org/10.1007/s00381-019-04084-5 [Epub ahead of print].